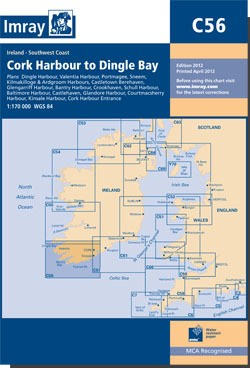 The south-west coast of Ireland from Cork harbour west to Dingle Bay. Scale: 1 : 170.000. One and two-minute gridlines. Larger scale plans of Baltimore, Castle Haven, Bantry, Crookhaven, Castletown/Bearhaven, Portmagee, Coutmacsherry, Dingle, Glengariff, Sneem, Ardgroom and Kilmakilloge, Schull, Valentia, Glandore and Kinsale. Tidal stream diagrams.